Mobile technology keeps users connected wherever they are, with virtually all the functions of a computer available at the touch of a finger on a smartphone or tablet. The business of app – for “application” – creation is booming, and apps for business and finance lead the list of new offerings. Investors can track developments and manage portfolios round the clock with a variety of free and paid apps for iPhone, iPad and Android devices. Mobile devices are the heirs of the home computer, making it possible to do business anywhere and everywhere. 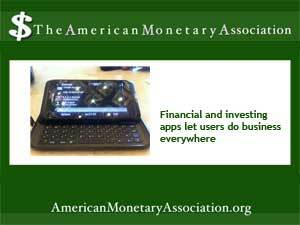 There’s an app for virtually every need, including investing and managing investment properties. Here’s a rundown of five handy apps, mostly free, from leading app stores for investors on the go. Available for iPhone, iPad and Android the Bloomberg app offers most of the features of the Bloomberg website. Users can read the latest business updates, listen to the site’s podcasts, and view trending financial and investing news. Mobile apps make managing investments and rental issues easier and faster – but they aren’t without risks. Experts advise treating your mobile device like a computer: passwords protect it, shop for apps at recognized stores such as Amazon, and use secure connections for transactions. Bur for the investor building wealth in income property as Jason Hartman advises, mobile apps can save time and even money. Can the Housing Upswing Predict a Downturn?